J Lyons was the largest catering business in the world. Barnett Salmon (1829 – 1897) and Isidore Gluckstein (1851 – 1920) established a tobacconist chain which undercut rivals by passing on bulk discounts to customers. With 140 shops, they were the largest retail tobacconists in Britain when they were acquired by Imperial Tobacco for £400,000 in 1902. In the 1880s, Montagu Gluckstein, a travelling partner in the firm, complained that pubs were the only place he could find refreshment. Gluckstein had identified an opportunity, and suggested that the company enter the business of non-alcoholic refreshment for themselves. A trial was established whereby the company catered for the Newcastle Exhibition of 1887. Contracts for other exhibitions followed. A new public company was established with capital of £120,000 in 1894 to pursue catering further. The original stakeholders were Montagu, his brother Isidore, brother-in-law Barnett Salmon (Nigella Lawson’s maternal grandfather) and distant relative Joseph Lyons. The Lyons name was adopted to distinguish the company from the Salmon & Gluckstein business. 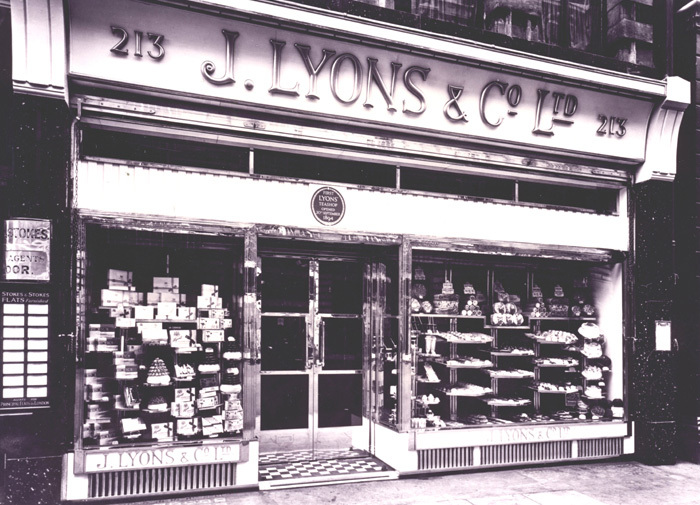 The first Lyons tea shop opened in September 1894 at 213 Piccadilly. It had 200 seats and a £30,000 lease. After a year the shop had made a profit of £11,400, and the company was able to pay a dividend of ten percent. The early tea room exteriors were enticing and extrovert, and the interiors were often glamorous, and intended to evoke the great Victorian exhibitions and Parisian cafes. The Lyons tea shop girls went on strike in protest against low wages in 1895. Cadby Hall was opened in Hammersmith to centrally produce baked goods for the company’s 17 tea shops in 1896. By 1900 there were 37 tea shops in London, and expansion had begun in the provinces, with six branches in Manchester, four in Liverpool, and two each in Leeds and Sheffield. Quality was good and prices were reasonable. The tea rooms were particularly popular throughout the daytime with lower middle class office workers. Cinema and theatre-goers patronised the chain on evenings. The first Lyons Corner House was opened on Coventry Street in 1909. The Corner Houses were much larger than the tea rooms, with a greater appeal to the middle classes. Live bands and an informal atmosphere helped to cement their popularity. The Coventry Street outlet became the Lyons flagship outlet, and seated 2,000 diners on multiple floors. It was the largest restaurant in the world. A second Corner House at the Strand opened in 1915, capable of seating 1,200 diners. J Lyons was one of the largest caterers in the world by 1911. Half a million meals were served every day throughout 200 shops and restaurants. The company employed over 12,000 people, including 2,000 people at Cadby Hall. The Cadby Hall works covered ten acres and included sixteen bakehouses, five cold storage rooms and three butchers’ shops. 20,000 people were employed by 1913. J Lyons was the largest baker in London, the largest tea merchant in the world and the largest restaurant operator in the world. Lyons also expanded into hotels, building the Regent Palace Hotel in London at a cost of £600,000. When it opened in 1915 it was the largest hotel in Europe with 1,028 bedrooms. Lyons tea was far and away the market leader by 1915: five million packets were sold every week by 160,000 shopkeepers. The company accounted for one in four cups of tea sold in London. Lyons had over £2 million in capital by 1917. Tea, coffee, bread, cakes, ice cream and groceries which had originally been produced for the tea rooms began to be sold directly to the customer, all manufactured at the company’s Hammersmith site. In 1918 Lyons acquired two leading packet tea companies, positioned second and fourth place in the market respectively: Horniman of London and Black & Green of Manchester. The acquisitions were intended to increase Lyons’s market share in the North of England: Horniman was strong in Yorkshire and G&B strong in the North West. The company had a share capital of £3.5 million by 1919. By this time Lyons was likely the largest catering company in the British Empire. There were 182 tea shops by 1919, making it easily the largest chain of its kind in the country. By 1919 Cadby Hall was struggling to keep up with demand, so Lyons acquired a 30 acre freehold site at Greenford, on the outskirts of London. In 1920 the company opened the largest tea packing plant in the world there. Coffee, cocoa and confectionery production were also transferred to Greenford. By the early 1920s the company was the largest food producer in Europe. In 1922 it was calculated that seven million people drank Lyons tea each week. Lyons opened the Cumberland Hotel at Marble Arch, which was the largest hotel in Europe, in 1922. The Coventry Street Corner House was extended in 1923 to create what was likely the largest restaurant in the world, with seats for 4,500 diners. Ice cream manufacture at Cadby Hall had reached the mass production scale by 1923. 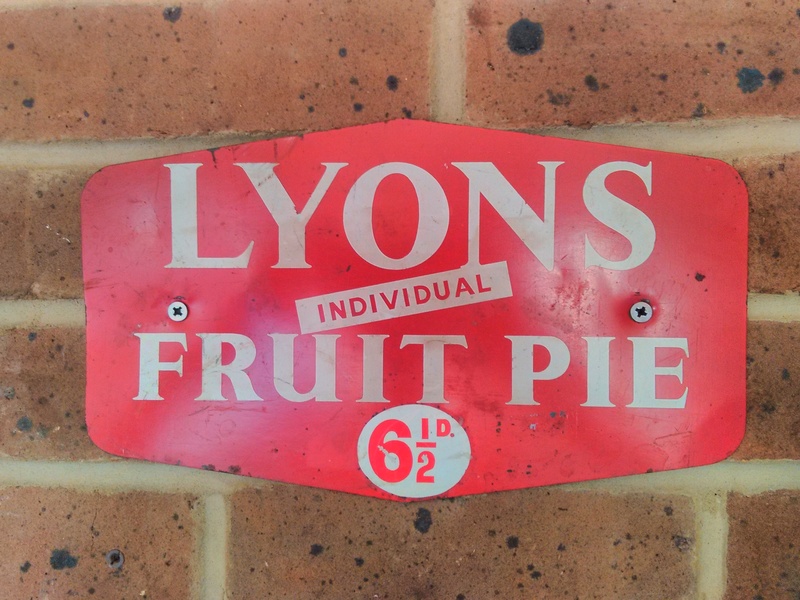 In 1930 Lyons was the 20th largest company in Britain, with a market value of £12.1 million and 30,000 employees. Over ten million meals were sold each week. Lyons held 14 percent of the packet tea market, with over 1.25 million packets sold every day. The teashop chain continued to grow strongly until the onset of the Great Depression. Teashop losses between 1934 and 1938 totalled £374,000. Despite this, due to its manufacturing and hotel concerns, the company remained the largest catering company in the world in the latter half of the 1930s. By 1937 there were over 42,000 employees. In 1939 Lyons produced 3.5 million gallons of ice cream. By 1939 Lyons had 253 tea rooms. Due to wartime labour shortages, self service was introduced at the tea rooms from 1941, and rolled out across the chain from 1945. From the late 1940s the company’s catering arm supplied the Wimbledon Lawn Tennis tournament. Part II of this post can be found here.